The traditional First Dance normally but not always signifies the start of the evening's entertainment, sometimes it is either followed with dances performed by the father and Bride or mother and Groom or several other variations. Some of you may plan to have other dances, some of you may want your guests to join you on the dance floor before the first dance ends, others may want their guests to join them on the dance floor for the second dance. Whatever you decide the choice as always is yours. We will work with you and are more than happy to introduce each dance and encourage your guests to join you on the dance floor as soon as your are ready. It's worth noting that your guests will normally follow the bride and groom's lead and so if you don't have your first dance until later in the evening you may find that out of respect, many of your guests won't take to the dance floor. Under these circumstances it's better to take your first dance early in the evening so that your guests can enjoy the celebrations right from the start. If you're not really looking forward to the first dance because maybe you have two left feet or you just think you will be really nervous, it may be an idea to ask us to invite your guests to join you on the dance floor part way through your first dance. This will instantly take the pressure off and make you feel more comfortable. If you decide you would like us to ask your guests to join you part way through, we would recommend you prime a few family members and friends, so that when we do anounnce it, they come and join you straight away. Because there is nothing worse than you not wanting to be on the centre of the dancefloor and no one wanting to join you. 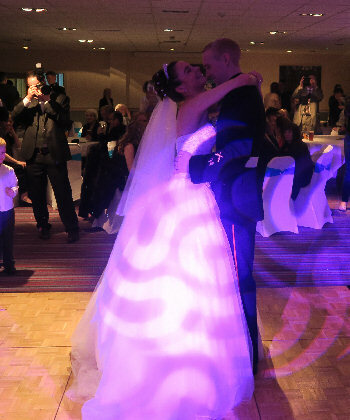 Choose SoundONE Cornwall Wedding DJ. Occasionally the bride or groom insist on creating a long and precise playlist, others just specify a first and last dance and leave the rest down to the DJ's experience. Either way this is absolutely fine with us, we will play whatever you want us to play, however when creating a playlist you may want to take into consideration your guests tastes too. For example, you may be more than a bit partial to a bit of rock music but maybe you're not keen on the 60's, so you create a playlist full of all your favourite rock tunes for the DJ to play. Then on the day you'll be having the time of your lives, you've just got married and you'll be dancing to your favourite music, but try to remember you will most likely have guests that may or may not be quite on the same level as you. The older guests especially may like 60's music as much as you like rock, the younger ones may like chart music as much as you like rock, but there is nothing on your list for them. There could even be guests that don't particulary like rock music. So bearing this in mind it's worth giving your guests some serious consideration, in our experience it is better to create a playlist with a wide selection of music so that at least everyone gets a chance to enjoy the music as much as you. This will normally make the day even better because all your guests will be able to dance and enjoy the music at some point. The First Dance is usually the most important dance at any wedding for the bride and groom, sometimes others will join them to participate in a carefully choreographed routine. Often the bride and groom would have spent several hours preparing a routine especially for this first dance. It's an important tradition and normally a great opportunity for the guests to take some lovely photographs. So you should choose the music for your first dance carefully. If you're not much of a dancer you may want to choose a slow song, as anyone can do a slow dance, but if your a bit more flamboyant then you may want to go for something a little different and give your guests a bit of a treat.